Here is a collection of baking and cooking recipes using shallot as one of the ingredients. This page will be updated on regular basis. 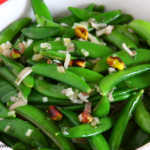 Easy to put together, this sugar snap pea salad recipe tastes great as a side or a main meal all by itself.